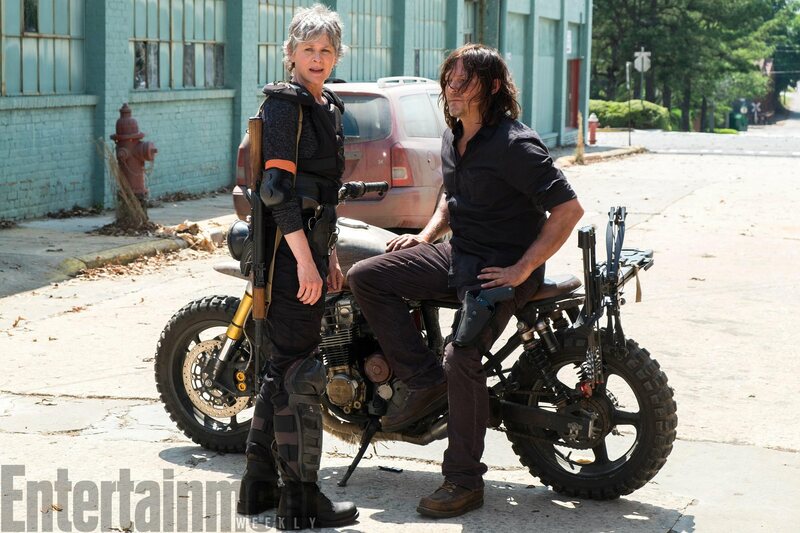 Fan-favorites Daryl (Norman Reedus) and Carol (Melissa McBride) go to war in this awesome first look at The Walking Dead season 8, which comes to us by way of Entertainment Weekly. Arriving just in time to whet our appetite before San Diego Comic-Con kicks off next week, below you’ll find Carol and Daryl next to the latter’s trusty motorbike, as they stare off toward some unseen point of interest – a threat, potentially? Or another survivor? One way or another, we know that Jeffrey Dean Morgan’s Negan will be on the back foot by the time The Walking Dead returns in October. In light of season 7, the ragtag communities of Alexandria, the Hilltop, and the Kingdom have cobbled together to form the apocalyptic equivalent of a coalition in order to defeat Morgan’s sadist once and for all. Doing so won’t be easy, of course, but the promise of all-out war will surely have the show’s impassioned fanbase reeling with excitement as season 8 begins to draw near. In tandem with the reveal, EW also caught up with series showrunner Scott M. Gimple to discuss the ways in which The Walking Dead‘s latest season builds on many of the heartfelt reunions of season 7 in a satisfying, compelling manner. The season finale last year, seeing all the characters together interacting as one, was thrilling. It was exciting to see all these configurations of characters we hadn’t seen before. Even Aaron merely giving Jerry an apple felt satisfying. This is that times a million. Though it would be cool if the season began with just everybody giving each other apples. I’d be down with that.” He pauses. “But it’s not that. As two of Rick’s unflinching allies, Daryl and Carol will no doubt find themselves at the epicenter of The Walking Dead season 8, and it’ll be fascinating to watch their arcs unfold once that aforementioned conflict begins in earnest. AMC’s flagship will have a big presence at SDCC next weekend, so stay tuned for more. The eighth season of The Walking Dead will premiere in the fall, but it may arrive a little later than expected. That’s because Fear The Walking Dead‘s third season, one which returns from hiatus on September 10th, is expected to stretch all the way through until October 22nd. Our guess? The network will likely hold fire until October 29th before unveiling The Walking Dead‘s latest batch of episodes.